While maintaining a uniquely Americana aesthetic, Stephen Wilson's internationally renowned work blends a high fashion influence with traditional quilting and mixed media. He is influenced by contemporary art, pop art, street art, graffiti and iconography, as well as traditional quilting and handicrafts. Collected by art enthusiasts worldwide, his pieces have also been featured in both solo and group exhibitions, as well as museum shows. For Stephen, the medium is the message. There is a long list of artists that create art using traditional means. However, Stephen's methodology is anything but traditional. Represented in his Luxury Series, the medium used is predominantly fabric and thread, combined with sculptural 3D printing, laser engraving, and painting. Heavily influenced by famous fashion houses, Stephen utilizes luxury textiles from a myriad of famed design houses, including Hermès silks and Chanel wools, amongst others. When one examines his pieces closely, they will notice that every line he creates uses thread to embellish or transform these luxurious fabrics. Stephen's works are meant to evoke questions regarding luxury consumerism. 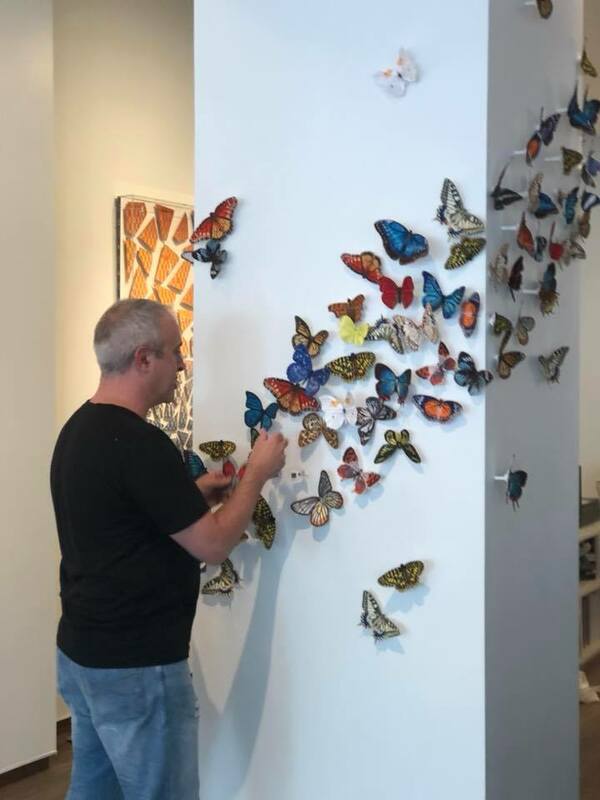 In Stephen's Shine a Light When It's Gray Out, the artist works with mixed media elements, such as 3D printed busts and skulls, embroidered butterflies, flowers, and gold leaf. Inspired by the recent birth of his now 16-month-old daughter, this series is thematically centered around hope and love. For Stephen, these works are meant to be a light in the dark, as well as a symbol of perseverance, in Stephen's words, "for ourselves, for our children, for all children." Each piece is unique and expertly crafted in his Charlotte, North Carolina studio.